Eldorado Creek Click on the image to enlarge and zoom in. 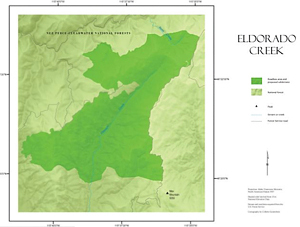 Eldorado Creek Roadless Area is the last natural area remaining in the more gentle and rolling forests that used to characterize North Central Idaho. A poorly drawn Forest Service boundary in 1987 resulted in some of the area being logged. Fortunately, at about 7,000 acres, it exceeds the minimum acreage recommendation for wilderness designation. Centered at the headwaters of the Eldorado Creek drainage, this parcel sits approximately fifty miles slightly southeast of Orofino and is accessible by numerous, mostly graveled, Forest Service roads. The interior can be reached by about eight miles of low-standard trails. Though the area is small, it is notable for its good soil, gentle terrain, and hardy evergreen canopy within the Lolo Creek drainage. Dense stands of pine, fir, cedar, spruce, larch, and hemlock create a cool, lush shelter for wolverine, deer, moose, and black bear to traverse. Elk that winter in the adjacent Pete King drainage and North Lochsa Slope are provided summer range. Unsurprisingly, big game hunters, as well as huckleberry foragers, are the most frequent human denizens. In the past, two prehistoric hunting areas and three Nez Perce Indian trails existed in this area, and a few old lookout and cabin remains can still be found. 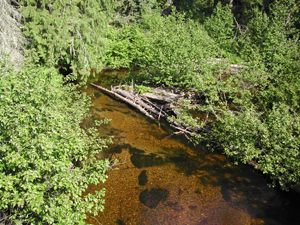 Though the natural appearance within the area has not been altered, intensely harvested timber areas surround Eldorado Creek. Without protection this verdant, unassuming gem could easily be absorbed by neighboring development.